With the fast development of mobile embedded photo and video cameras, the demand for high quality self-operated image acquisition devices has also increased, imposing additional requirements to the future technology: we want an automated device, which follows us outdoors and continuously focuses on us no matter which activities we perform (e.g. sports). That is what Lily Camera actually does, currently in beta testing development stage, and expected to reach the market during the summer of 2016. The Lily camera has been built on drone technology, as far as flight capability is concerned, but it doesn’t need any human intervention to control its flight. It uses tracking technology to focus and follow a specific target (i.e. the person that wears the tracking device). The compact and small size camera, with a weight of 2.8 lb (1.3 kg) and dimensions of approximately 10.3x10.3x3.2 inches (~26x26x8.1 centimeters), has been designed to fit into a backpack and to be easy to carry around by people performing outdoor activities and wishing to self-record without any help from other people. 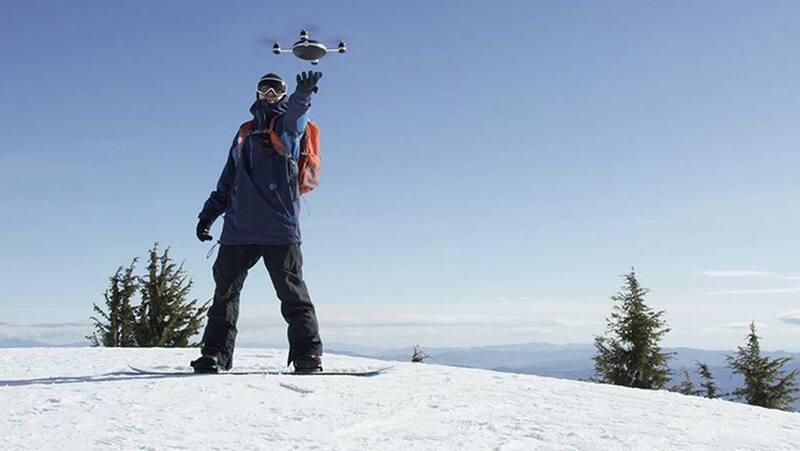 The Lily Camera is waterproof, to allow recording in any weather conditions, and comes equipped with a built-in lithium-ion battery which, when fully charged (the charge time is 2 hours), ensures about 20 minutes of flight time. Once outdoors, when you would like your camera to start recording you activate it, throw it in the air, and no more intervention is needed until the time you stop it. The Lily Camera will automatically adapt its altitude and speed, according to the speed and visibility of the target device, and uses computer vision to optically follow your features. It can fly at an altitude of between 5 and 50 feet (1.75 to 15 meters), with a maximum speed of 40 km/h and at a distance between 5 and 100 feet (1.75 to 30 meters) from the target device. The sensing technology of the Lily Camera includes an accelerometer, a three-axis gyro, a magnetometer, a barometer and a GPS. The two video cameras, front- and bottom-facing, allow for a resolution range between 1080 pixels at 60 frames per second (fps) and 720 pixels at 120 fps. The embedded micro SD memory only allows for a total of 4GB, which is sufficient for the total flight time supported by the one charge of the battery, but the Lily Camera also comes with an external memory card slot, for users who would like to keep more than one recording session in the memory of the camera. The Lily companion app, which is available on iOS and Android, is used to change the settings of the camera, to create custom shots and to edit and share content. The tracking device is designed to be very light (only 1 oz/28 grams) and very small (~2x0.65 inches/ 5.2x1.7 centimeters), to be wearable on the wrist, similar to a watch. The device is also equipped with sensing technology (accelerometer, GPS, vibration motor), including a microphone for good quality speech acquisition of the person that wears it. The Lily Camera automatically synchronizes audio from the tracking device with the video it records. Although the company already has a sales number of over 500 devices, at a price of approximately US$800, these were only released for beta testing purposes. According to the company, although the shipping of pre-ordered devices was initially announced for the beginning of 2016, it had to be postponed until Summer 2016, to solve some of the technical challenges of the flight control software, including new algorithms for trajectory generation to create circular paths around the user and computer vision to detect land using the bottom facing camera. It is our feeling that this type of technology will become very popular in the near future, and the question is if additional laws and regulations are needed to avoid misuse and protect privacy of others who might just get in the way of a recording camera.